There are many websites and online family trees that claim President Lyndon Johnson is a distant cousin of fashion designer Liz Claiborne through a common ancestor of Thomas Claiborne Jr and his wife Anne Fox. LBJ's connection is reportedly through their daughter Martha Claiborne. Unfortunately I have not found any evidence to support this. LBJ's mother Rebekah (Baines) Johnson identified her husband Samuel Ealy Johnson's 3rd great-grandparents as John and Peggy Webb. I am not aware of any documents that have been found for John and Peggy Webb. 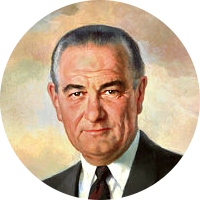 LBJ's mother did not identify either John or Peggy Webb's parents. Although Peggy is a valid nickname for Martha, the maiden name of Peggy is unknown. Martha Claiborne is probably the daughter of Thomas and Anne (Fox) Claiborne. She was in the guardianship of Joseph Thompson and his wife Sarah Claiborne (a daughter of Thomas Claiborne and Anne Fox). Sarah is believed to be Martha's sister and to have become her guardian after their parents died. The reason we know about Martha is that apparently she was abducted from her sister's home while still a minor. Her abductors were said to have included a Patrick Napier. Martha is believed to have eventually married Patrick Napier as his will names a wife Martha. Without evidence that indicates Peggy and Martha are one and the same, this kinship between President Lyndon B. Johnson and Liz Claiborne will have to remain unproven.